In an elaborate ceremony in the beehive-shaped Kigali Convention Centre, 44 African Union member states signed an agreement on an African free trade area. President Cyril Ramaphosa is confident Africa will unite, even though the continent’s two biggest economies, South Africa and Nigeria, still had to come on board. By CARIEN DU PLESSIS. Much was made of Africa’s “historic moment” – second only, it was said, to the founding of the Organisation of African Unity 55 years ago. Such was the hype that real information was at times difficult to find. For instance, there was no clear announcement on which agreement a country was signing if they weren’t signing all three – the Protocol on the Free Movement of People (across Africa), the African Continental Free Trade Area (AfCFTA) agreement, or the opt-out-for-now-but-still-committed-to-it Kigali Declaration. An accurate list of which country signed what was also still elusive. South Africa, as it turned out, signed only the Kigali Declaration, with 42 other African Union states, although at some point some communicators from the Rwandan side, as well as a list of signatories, said South Africa did sign all three. Forty-four states signed the actual agreement, aimed at improving trade between African countries, while 27 signed the Protocol on the Free Movement of People. Both of these were flagship projects of the AU’s long-term plan, Agenda 2063, introduced at the AU under the leadership of Nkosazana Dlamini Zuma. A group of journalists, including this Daily Maverick reporter, was hosted by the Rwandan government in the three-star The Mirror Hotel, not far from the conference venue. It’s a big investment, and Rwanda wanted to make it work. Kagame, after all, has a reputation to uphold as a no-nonsense business-minded president. There were some hauntingly beautiful moments, like when the choir of Rwanda’s first music school, the Nyundi School of Art, sang Asimbonanga as the Sahrawi Republic head of state stepped up to sign, but there were also schedules that weren’t quite adhered to, partly due to the length of the presidential caucus first thing in the morning, and then to the length of the signing ceremony (it started with a commitment by 30-something countries, but in the course of the day grew to 40-something). By the time of the closing at 16:30, some presidents, like Cyril Ramaphosa, had already had to leave to wrap up and catch their flights. Ramaphosa did, however, grant a 30 minute-interview for the handful of South African journalists (and not just to the SABC, as his predecessor did in especially his second term). In a hotel room next to his suite at Kigali’s Marriott Hotel, Ramaphosa explained that South Africa supported the free trade area ideals. “All that holds us back from signing the actual agreement is our own consultation processes,” he said. Nigeria, whose president Muhammadu Buhari had to turn back on his way to the airport because of objections from business groups, didn’t sign the agreement either. Nigeria, too, needed to go through an internal consultation process, said Ramaphosa. The agreement wasn’t dead in the water at all. 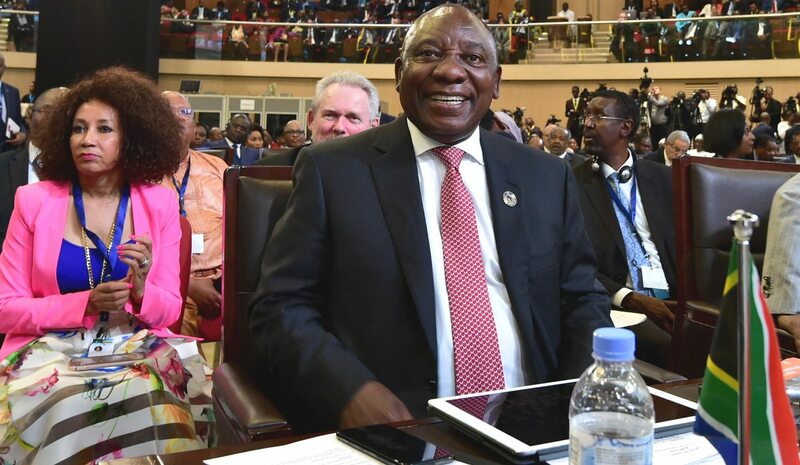 In fact, Ramaphosa even has a vision for a single African currency as an ultimate outcome of a free trade area, something he floated at a business forum as part of the summit on Tuesday. Some businesspeople even suggested something similar to Bitcoin at that forum. “Africa is developing in a wonderful way, further on this economic journey, and we will be beginning to interface with the notion and the idea of a single currency,” Ramaphosa said. Even though South Africa still has a lot of hurdles to overcome in terms of open borders, Ramaphosa wanted this changed too. Our African sisters and brothers are forever complaining about the strict rules and the intransigent visa bureaucracy. Ramaphosa met with Kagame on arrival in Kigali on Tuesday, and they talked about making it easier for Rwandan citizens to get visas. The South African visa office in Kigali was closed in 2014 after a spat between the countries over the murder of an opposition leader in South Africa. Ramaphosa, surprisingly, revealed in Wednesday’s interview that the visa issue was bigger than just Rwanda. “There is a deep yearning in Rwanda and the region for this visa matter to be resolved, and we need to open up the borders of our country and allow people to move,” he said. Under the free trade accord, it should be easier for businesspeople to move around on the continent, he said. Other countries, like Rwanda, could come to do business in South Africa and vice versa, “because when they come, they come with money”, he said. Movement of people across borders “does not only mean people are coming to South Africa to take our people’s jobs”, he said. “It also needs to be seen in another dimension, that we are sending companies here (to Rwanda) to do business, to trade and to learn new skills. And as it is now, Rwanda has a lot to teach us. They have developed so quickly and got out of the total disaster they had 20 years ago and they are a completely transformed country,” he said, with reference to Rwanda’s genocide in 1994. Some analysts say it could take another 10 years after the signing of the agreement – phase one out of six phases – for continental free trade to become a reality. After the signing, 22 countries had to ratify the agreement – meaning they had to go through domestic parliamentary processes – for it to come into force.